Buy our Canada hotel email database and expand your hospitality-related brand. 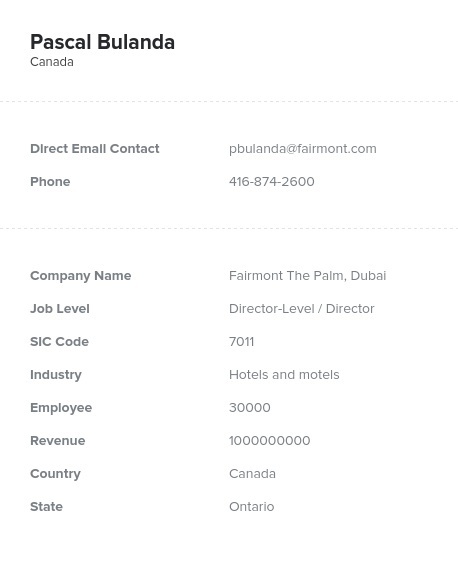 This Canada-based email marketing list includes verified Canada motel contact information and details, including direct phone numbers, email addresses, and more. With it, you can form B2B connections and start making sales in minutes! Canadian hotels and motels offer accommodations for business professionals, tourists, and travelers who need temporary or long-term rooms, suites, and housing. Many motels in Canada offer amenities including room service, laundry service, spa options, an exercise room, and concierge service. They need supplies for all of these functions, from soaps for the bathrooms to kitchen equipment to pool chemicals. Perhaps your products or service could help the property owners and operators of hotels in Canada welcome and satisfy their guests. If so, use our Canada hotel mailing list to tell them about it. With this Canada motel email database, you can target the right audience for your hospitality-related services and goods without wasting time. Whether you sell laundry services, coffee products, entertainment packages, printing services, or cleaning supplies, you can build your business when you use our Canadian hotel email list to market to the people who are mostly likely to buy what you're selling. You'll get a wealth of human-verified contact information, from mailing addresses to fax numbers, so you can email leads right away. To further focus your efforts, you might want to use our custom list-builder tool to narrow your Canada motel mailing list to include only certain sizes of hotel or geographical areas. From hotels in Halifax to motels in Moose Jaw, we have the targeted sales leads you need!